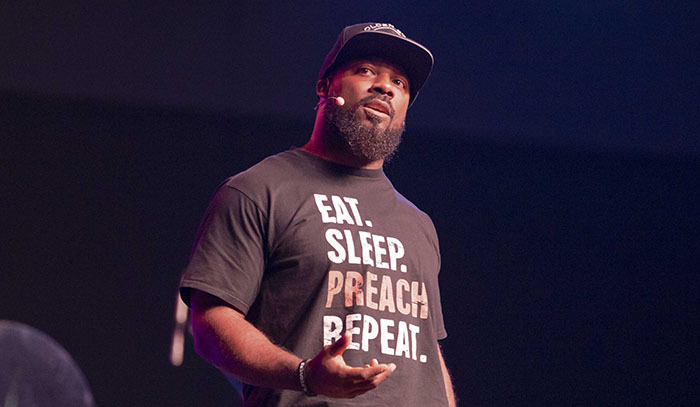 Dewayne Hawkins of Life Givers Church in Goodyear provided some straight talk at Chapel on Monday about the wayward ways of the world and why so many people care about it too much. Hands in pockets. Wide-brimmed black hat. “Eat. Sleep. Preach. Repeat.” T-shirt. 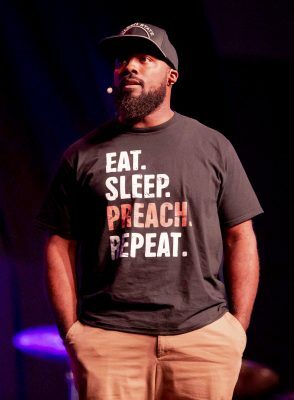 Frequent references to his audience as “family.” Key points punctuated with “watch this.” Yep, Dewayne Hawkins is as relatable and down to earth as a public speaker can get. Hawkins’ easygoing manner made his message that much more relatable. “You spend your waking hours and, for some of you in here, even your resting hours wrecking your brain over the next exam, the next paper, the next class, the next internship, the next this, the next that, the next relationship. … My hope is to free you today. Your life matters way … too … much. It’s all a matter of focus. Hawkins asked the students to think about which one dominates their lives – schoolwork or the Gospel. This does not mean they shouldn’t care about their grades. But it’s a matter of priorities. But God gives His love to us in that while we were still sinners, Christ died for us. ● For a replay of Chapel, including the music of the Worship team, click here.